Posted: Fri 16 Jul 2010, 20:16 Post subject: Flash player update? I have been playing with Macpup Opera 2.0 and so far am really impressed. It seems to have solved some screen border issues I was having with Macpup Foxy. Having said that I prefer Firefox which I installed via pet. It seems to update to the latest version fine, but I cannot seem to find out how to update the Adobe Flashplayer. Any suggestions would be greatly appreciated. Thanks very much. This link takes you directly to the pet etc. Updated version of the MP-Calm theme fixed the clock .I will have it uploaded in a while. OK, the calm-02.pet is up on my macpup page , Enjoy. Both Fox 3 and o2 have early version of everything but they dont do all the stuff the new one does. Just load "run everything" in the module setting panel. meun-settings-modules. It will add it to the main menu. Most likely I will hold off on the next Foxy until they get firefox 4 ready for linux. I still have a lot to do before the next pup is released. I need to fix the new base.And I may have a stable version with .061 and a unstable version with .49898. I am not sure yet. 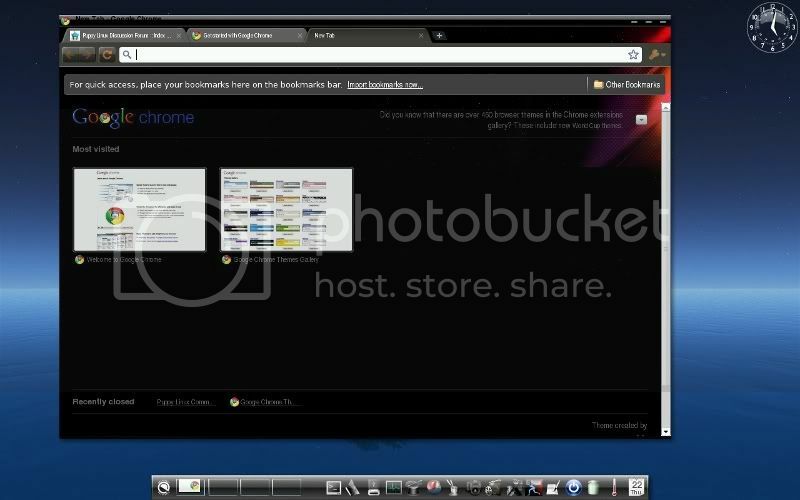 Thanks to GrumpyWolfe, we where able to run chrome in opera2.0 . After install go to /opt/google/chrome in Rox and delete chrome-sandbox before running it. Posted: Sun 25 Jul 2010, 00:07 Post subject: VLC??? Has anyone been able to get a version of VLC to work with MacPup Opera 2.0? I am finding some .FLV files which will not play in the version of gxine available in MPO 2.0. I have tried the various .pet's available, and so far no luck. But it may not play your files. 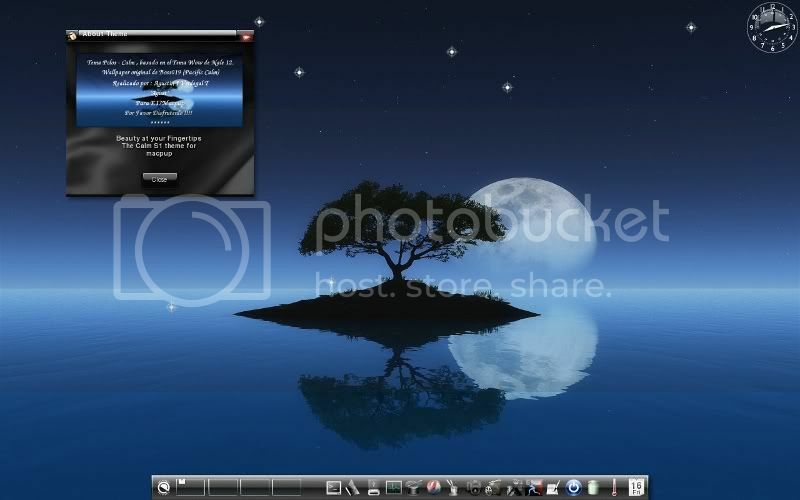 You may need to try an updated xine or mplayer. But I have had little luck with them before. Thanks for the reply. You are right, it doesn't play the files I am having trouble with. Hope someone makes an updated version available soon. Thanks for all your efforts. I have tried to download and compile some extra modules, and all in all it went fine. Yet when I tried to load the modules I often get an error of "There was an error loading this module, The error was : /us/lib/enlightenment/modules/module_name/linux-gnu-i686-ver-svn-02/module.so : undefined symbol. Would you like to unload this module?" I get this for most modules or gadgets that compile correctly and shows up in the menu. Of all that compiled right (most of them) only one would actually load (the memory gadget). Do you have any idea why it says "undefined symbol"? After days of scouring the internet I can find an answer to what this even means , and how to remedy it. I am not a Mac, not a PC... I am a Puppy. The extra modules that are in the SVN right now need all the new extra stuff that is in ecore,evas,efreet.enia & edje. They also need lua and pam . The version of those libs that are in O2 dont have everything that they need to run. They will compile cause the build scripts will run but when you load them the support stuff isnt there. Like I said I have all of the extra modules working in the latest snapshot but ecore and evas are so unstable now its almost useless. ah i see. That make sense, I had not thought about the build scripts being different from the installed dependencies. I thought it checked for those. Well regadless thanks again, there's that mystery solved. I tried coping over the new version of the libs cause they are svn-ver-6 to get the new "everything" to run in o2 but even the core parts of evas, enia and ecore are different.